[S185] Concord, Massachusetts Births, Marriages, and Deaths, 1635–1850, 72, David Brookes b. [S282] John Brooks Threlfall, "Thomas Brooks," 13. [S185] Concord BMD, 146, Dauid Brooks/Betty Buss m.
[S187] Vital Records of Acton, Massachusetts, to the Year 1850, 138, David Brooks/Betty Buss m. Concord. [S187] Acton VR, 255, Elizebeth Brooks d.
[S187] Acton VR, 138, David Brooks/Elisabeth Brown, int. [S187] Acton VR, 254, Elizabeth Brooks d.
[S59] Connecticut Gazette, 16 Sep 1818, Deaths: 9 Sep.
[S187] Acton VR, 21, Silas Brooks b. [S187] Acton VR, 20, David Brooks b. [S187] Acton VR, 20, Joseph Brooks b. [S187] Acton VR, 21, Reuben Brooks b. [S187] Acton VR, 19, Betty Brooks b.
Findagrave.com, memorial #79152354. Courtesy M. Shepard. [S187] Vital Records of Acton, Massachusetts, to the Year 1850, 254, Elizabeth Brooks d.
[S485] Vital Records of Scituate Massachusetts To the Year 1850, 1:50, Deborah Brooke bp. [S485] Scituate VR, 1:53, ch. Deborah Brooks b. [S431] Evelyn S. Beran (Madison, WI, e-mail address), research shared with the author, 1997–2002, citing Stetson Descendants, Torrey. [S431] Beran, citing a collective bibliography of Briggs, Stetson, Deane, Holman, Savage, Torrey, and The American Genealogist and New Haven Genealogical Magazine. Woburn's First Burial Ground, as it stands today. Photo by Jan Mongoven. Property 16 Jan 1739/40, Woburn, MA Jabez Brooks, of Woburn, husbandman, "in consideration of love, good will, and affection....towards my loving wife, Hepsibeth Brooks," conveys certain household articles and wearing apparel, one large Bible, one silver spoon, a large cupboard, and all "my linen," and a bond due to her from "my son," Ebenezer Brooks. [S210] Edward P. Johnson, Woburn Records, 1:28, Benjamin Brooks b. [S210] Johnson, Woburn Records, 4:41, Benjamin Brooks, epitaph, notes. [S210] Johnson, Woburn Records, 2:20, Benjamin Brooks d.; 4:41, Benjamin Brooks, epitaph, notes. [S59] Boston Evening-Post, 16 Jan 1769. [S210] Johnson, Woburn Records, 4:41, Benjamin Brooks, epitaph. [S210] Johnson, Woburn Records, 3:34, Susanna Brooks/Josiah Johnson Esq. m.
[S522] Samuel Sewall, The History of Woburn, 2:583. [S210] Johnson, Woburn Records, 1:29, Susanna Brooks b. [S210] Johnson, Woburn Records, 1:29, Benjamin Brooks b.; 2:20, d.
[S210] Johnson, Woburn Records, 1:29, Jerusha Brooks b. [S210] Johnson, Woburn Records, 1:29, Joseph Brooks b. [S210] Johnson, Woburn Records, 1:29, Hephzibar Brooks b. The Bahamian Alburys are believed to descend from Henry Albery of Locks Farm, near Wokingham, Berkshire, England. Henry died when his sons were relatively young and left instructions for the property to be sold and the proceeds divided among his heirs. His son, William Alburie, age 15, embarked from London on 30 September, 1635 on the ship Dorset, bound for Bermuda. His brother John sailed to Rhode Island and was believed to be ancestor of the Albro family. In 1650 Capt. William Alburie/Albury sailed from Bermuda to Harbour Island on the yacht Gertrude. In 1699 the Spanish attacked Nassau and killed several of its inhabitants (including William's likely son Joseph). Joseph's children, John Albree/Albury (b. 1688) and his sister Elizabeth (b. 1691), were orphaned by this event. They were taken in by the captain of a Boston vessel who brought them to Boston early in the year 1700. 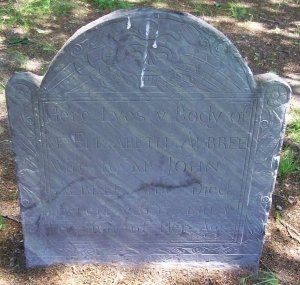 In May 1711 John married Elizabeth Green of Boston and they are the ancestors of the Albree family of New England. — The Bahamas DNA Project, http://bit.ly/QNv5SJ. In a Spanish/pirate raid on Nassau in 1699, the town's occupants were put to the sword. The only survivors, says Charles Brooks, were John and his sister Elizabeth, three years younger. They fled for protection to a cargo vessel, whose captain brought them to Boston in 1700 and took them into his family. They were put to school and John was apprenticed at the age of 14 for seven years to a Malden weaver. "His master found him a silent and thoughtful boy, and made him a good weaver." When he became of age he moved to Medford, and soon bought a small house. He operated a gristmill and weaving shop in Medford and "grew comparatively rich." His sister Elizabeth, who died unmarried, became his housekeeper. [S48] Rev. Charles Brooks, History of the Town of Medford, 519, 520, 521. [S368] Vital Records of Medford, Massachusetts, To the Year 1850, 334, Elizabeth Albree d.
[S368] Medford VR, 334, John Albry d.
[S48] Charles Brooks, Hist. Medford, 520, 521. [S368] Medford VR, 14, Joseph Alberry b. 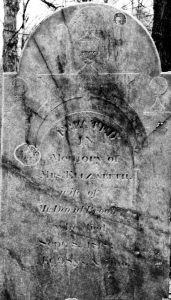 [S368] Medford VR, 14, Elizibeth Alberee b; 334, Elizabeth Albree d.
[S368] Medford VR, 14, Ruth Albery b. [S368] Medford VR, 14, Susanah Albree b.
Findagrave.com, memorial #26920766. Photo by BobBoston. [S368] Vital Records of Medford, Massachusetts, To the Year 1850, 334, Elizabeth Albree d. (g.s.). [S368] Medford VR, 334, Elizabeth Albree d.